If your partner is a Pisces, it’s all about the depth of feeling. Pisces people are super sensitive and very easily hurt; they need partners who can share their feelings while providing stability and structure. Pisces could be your soulmate if you’re seeking a spiritual union and you don’t mind tears. You are the artist, the dreamer, the enigmatic lover of all things ethereal. It is why of all the signs you may be the hardest to pin down, but once love sinks its teeth into you, your heart turns to mush and the Pisces mind which floats around so airily, lights of fire with passion and romance. The Pisces can’t help but be an empathetic creature. They are always reaching out and if they touch you, their caring and sympathy can be infectious. It is why developing crushes on Pisces can be both rewarding and dangerous, and why being in relationships with them can be exactly the same. Their two sides can drive even the most accommodating lover insane but they can also find the right words to say when none seem to be proper. Despite the Pisces ability to seem almost psychic they happen to be the only water sign that doesn’t have a shell (the others are Cancer and Scorpio). The fact that they live so much in their minds means that even the littlest comment, or offhand remark that seems to be directed at them, can completely unhinged them. This can make boy/girlfriend tiff even more difficult since the ramifications of the standard relationship insults can have much more disastrous effects than anticipated. It is also good to remember that when starting to date, or even flirt with a Pisces, to make sure that only your best intention find their way to the surface and that any nefarious plans stay buried so deep that you don’t even know them. If your Pisces feels threatened they will disappear. They can blend into walls, or bars, and like a chameleon they will make themselves scarce. In addition to this great invisibility to trick they can also give off such a mask of approachability that no one even wants to talk to them. This can also ward off unwanted romantic attention, but it can also prevent Pisces from the romance they desperately need in their lives. Don’t be off put by their standoffs nature, and pursue them gently but persistently, chances are you have nothing to with their flaky mood. Because of the volatility of the Pisces personality and the sensitivity of their more spiritual and emotional personality they need a strong balancing force. This means that they tend to have a deeply important friend or relative or even a therapist, in their life, and that means that being in a relationship with a Pisces means accepting the other close connections that they have in their lives. If you learn to use and understand these connections they can work to help you’re dating and loving a Pisces, if you don’t and are threatened or suspicious of these people in his/her life, it will wreck your chances. When starting to woo a Pisces it is important to remember that even though you may find them at first to be difficult to make decisions with, and usually have no idea what they feel like eating, or which movie they want to see, they are incredibly adaptive. Instead of constantly looking for their response it is important to use suggestion to tease out their wants and desires. They usually will love what you want and can be convinced to try any new food and watch anything, as long as it is short on violence and long on fun, thoughtful entertainment. The fish can harbor secrets, which can be very disturbing to the Ram. The Ram will know something is wrong but will not be sure what it is, so they are left with a feeling of uselessness of not being able to help and no clue as to what they should do to make it better. These two can romantically hum together. The heightened Pisces intuitiveness feels and knows exactly what Taurus feels and needs at most times. This type of support is not only endearing but loveable. Both being romantic creatures, staying home snuggling on the lounge together can overcome a lot for differences! Pisces exudes a mysterious and magnetic appeal that Taurus finds irresistible and they readily fall under the Fishes’ magic spell. The Bull also feels satisfaction in lending their earthy strength and practicality to bolster Pisces in their moments of vulnerability. Pisces delights in the security a Taurus provides, finding a safe haven in which they feel protected against the sometimes overwhelming demands of the world. In turn, the Bull is refreshed by the ocean of mystical and sensual depths that Pisces calls home. These two find mutual support in their complementary natures in a way that makes each of them feel more complete. Good food and wine, beautiful scenery, music - the simple joys of life are enhanced when these two share them together. There is a lot of good in this union and a deep love and caring of each other can result in a lasting relationship. Pisces Javier Bardem and Taurus Penelope Cruz are one example of the true loving commitment that’s possible for these two Sun signs. When each supports the other with the complementary gifts they naturally bring to the table, both come alive and can experience a joy and freedom that forges a very strong bond. However, there also needs to be unconditional love and acceptance of each other’s differences for it to work. Taurus must give Pisces room to express themselves without shutting them out or judging them. Pisces must allow Taurus the space to be silent and peaceful without fearing this means they are withdrawing from the relationship. Each may always be a bit of a puzzle to the other in some ways, but the potential for a truly fulfilling relationship makes the puzzle worth living with, if not solving. They have an innate understanding of the other’s dual personality. Two fish, two twins, it could get crowded in this relationship, but at least they comprehend the duality in each other’s personality. Their minds are both highly active and each is drawn to discovery and exploration. This couple can delight each other with their respective expressive talents. They feel inspired and excited by the energies that ignite between them. The Twins draw Pisces out of their watery world and out into the bright light of day and the Fishes can add depth and substance to the Twins’ whirl of activity. Pisces can be exhausted by the Gemini need for speed, however, and Gemini can feel thwarted by a perceived lethargy in their Pisces companion. While Pisces is procrastinating, Gemini will have reached a point of boredom and long moved on. If these two can master the art of compromise, there’s a chance that it can last the distance. But they have to both be prepared to put some effort in, and when it concerns relationships, these two signs prefer to take the easy street. The Gemini who wants to make this pairing work must find genuine interest in exploring the Pisces inner world of deep sensitivity and psychic impressions without feeling the need to solve it like a math problem. Pisces needs to find acceptance for their partner’s intellectual approach to life and feel secure that the Twins will really be there for them when they need it most. Gemini needs an appreciative audience for their Mercurial talents, and Pisces can fill that bill. To keep Pisces interested, though, Gemini cannot ignore or dismiss the gentle Fishes’ inner longings. These two click. They can build a beautiful love nest together that can last an eternity. There’s an innate understanding that goes way beyond the physical. The Crab and the Fishes both make their home in the watery world of emotion and psychic sensitivity and their connection goes deeper than most relationships can ever hope to achieve. These two are a creative team par excellence. They find fulfillment sharing artistic pursuits and exploring all manner of psychological and mystical interests together. Both signs are intensely sensitive, and the magic they weave between them makes their relationship a source of strength for each of them. Together they face the world with more security and joy, knowing their tender natures are cherished, their deepest secrets treasured. Their home can be a cozy oasis of artistic inspiration and they love sharing it with their circle of friends. Pisces like to be looked after and Cancer likes to nurture and care for people – it’s a match! This is very much a spiritual connection. It’s a simultaneous meeting of the mind, heart and soul; apart from the occasional emotional upset and intermittent drama caused by moon madness, their life together runs smoothly. A Pisces Cancer relationship can be the romantic standard against which all ‘soul mates’ are measured. With self awareness on each of their parts and a commitment to share the burden of real world responsibilities, these two can enjoy the love of a lifetime. Pisces and Leo are both extremely romantic as well as dramatic, and together these two radiate the glamorous aura of a ‘power couple.’ Each being naturally creative, exploring the arts and all kinds of creative expression can be a source great mutual satisfaction. The belief they have in each other generates strength for them both and can go a long way in securing this union. Pisces brings an enchanted allure to which Leo ardently responds, thinking this may be the ideal mate to share their kingdom. The Fishes find refuge in the Lion’s generous heart and courageous spirit. They are naturally drawn to the solar power, warmth and authority the Lion commands. Leo is enriched by the Pisces sincerity, depth and insight – not to mention the Fishes’ appreciation for their royal partner! Both being affectionate is an attraction factor, and as long as Pisces doesn’t mind being the more subservient, leaving Leo to be king or queen of his-her domain, life should remain calm and harmonious. This relationship has good possibilities. There’s a mutual respect for individual qualities, and if they could sit around all day being romantic that would be great, but in the real world, there are some fundamental problems to deal with on an ongoing basis. If things go wrong, Leo can dramatically sulk and brood while Pisces retreats or cries. Knowing the potential pit-falls, if both Leo and Pisces are reasonably mature and committed to work at their relationship, this can be a powerful union. There’s a natural blend of mind power and intuition with these signs. As opposite sides of the same coin, Virgo and Pisces click on a gut level. Both of them recognize and admire each other’s virtues, which they may feel are lacking in themselves. Virgo excels at analysis and has set goals with step-by-step instructions of how to reach them. Pisces, on the other hand, will wish their dreams true. The power of Pisces imagination, faith and perception can impress even critical Virgo, while the Fishes thirst for the order and earthy security Virgo provides. Both understand the heart felt instinct to uplift their fellow man and can share with each other secret fears they may hide from the world. Each of these two tend to struggle with low self esteem, regardless of outward appearances. Mutual support, healing and personal growth are sure to factor into this relationship. They believe in the power of positive thought and belief. Put these systems together – it can be a dynamite connection. The pairing of these two may surprise others at first, but they often feel an immediate attraction for each other, in spite of their outer differences. Intellectual and instinctual combinations are powerful. They need more time together to truly appreciate each other’s uniqueness. If they persevere past the initial impressions, they will learn that the other has a treasure chest beneath the surface. Together they can complement and support each other in ways that are truly satisfying. Wine, roses, music – it’s just what the doctor ordered. With this pair, there’s no shortage of romantic interludes to keep their hearts singing and their dreams heavenly. Venus, ruling planet of Libra, brings beauty, harmony and justice to Neptune’s inspired light of spiritual truth. These two can find their association a soothing balm to the soul. Both excel at giving thoughtful, little tokens of affection and courtship between these two is sweet and old fashioned. Their meeting may feel somehow fated. Pisces often feels drawn to serve Libra somehow, and should guard against losing themselves in the enchanting Libra charm. Both signs readily fall in love with being in love, and although they dream of being with their perfect partner forever, they are scared of making a wrong choice, therefore, a commitment may be a while coming. There is a natural caring between these two that goes beyond that of friendship - however, as well as lovers, they will also be good friends. Their shared values and ability tap into the higher planes can overcome the potential blind spots in this relationship if both parties feel it is worth it. With good contacts in the rest of their charts, between the Libran charming smile and Pisces dreamy eyes, these two may never leave each other’s arms. Like Burton and Liz Taylor, they complete each other. There is a deep connection with the Scorpion and the fish - this is a red hot attraction that both of them feel immediately. Scorpio and Pisces can go places together that no other pair can; they understand each other perfectly and can get lost in each other’s dreams for the longest time. The seductive pull they exert on each other feels hypnotic, and their passion potential is not limited to romance. Scorpio and Pisces are each deeply interested in the mysteries of life and love to explore psychic and mystical studies. As water signs, creative expression comes naturally to both and they take pride in each other’s talents and achievements. 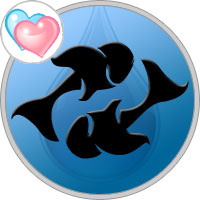 Scorpio feels naturally drawn to protect Pisces, and the Fishes nurture Scorpio in all ways, to mutual benefit. This union is complete. Theirs can be an intense love that takes them all the way to the heavens with plenty of action to play in the real world – it’s a match! When they’re together, it’s breathtaking! But beware – it’s also a partnership that falls into the category of, ‘they can’t live together, or live without each other.’ Powerful attraction never fades between these two, but they need strong communication skills and problem solving techniques for the relationship to endure. There’s an intuitive and mystical connection between these two. The Sagittarius quest for truth complements Pisces inherent spirituality. Together they explore paths of higher learning in a spirit of adventure. There is an easy energy between them that’s almost childlike, providing lots of fun and frivolous activity. Sag has an upbeat, energetic approach to life that invigorates Pisces, who happily accepts the Centaur’s invitations to roam outside the Fishes’ habitual comfort zones. Sagittarius feels drawn to the old soul in Pisces, and each finds attractive qualities in the other that are distinctly different from themselves. Sagittarius enjoys a robust connection with their bodies; they’re often athletic in some way, which naturally appeals to Pisces, who are energized and excited by Sag’s physical exuberance. The Archer’s interest is piqued by Pisces sensual and mysterious beauty. Pisces compassion is touching to Sagittarius, and Sagittarius positive nature sits well with Pisces who doesn’t operate well around negative people. They have an expectation of idealism in life, and won’t settle for less! There’s something magically special with this union. These two do meet in spirit, mind and body. However, unless they work hard to spend a reasonable amount of time together they are destined to grow apart. If strong contacts in the rest of their charts balance the friction between them, with enough caring and compromise, it can work beautifully. They can access deeper levels within themselves when together. This is a magical connection, and although they are very different, it works because they are able to transform themselves when in each other’s presence. Capricorn is the rock of stability that supports tender Pisces, giving them a framework of security and safety in a world that can feel overwhelming. Pisces expands the Capricorn world with their faith, vision and emotional nurturance, encouraging Cap to relax and lighten up. In Pisces soothing presence, the Sea-Goat remembers there’s more to life than work and responsibility. The Fishes help Capricorn dream, and Cap’s true desire is to make their dreams a reality. Cold, hard, mundane reality is Cap’s domain, while Pisces is directly tapped into divine inspiration. Together they can make nearly anything happen! The earthy, go-getter Capricorn energy blends with Pisces sensitive creativity in ways that stimulate the best in both. There’s an instinctual attraction that plays across the board – physically, emotionally and psychologically, these two click. They think alike and agree on many of the same issues, making this a compatible and workable love-match. When these two click, it can be enchanting. There’s an inherent dynamic of stimulation and support in this relationship. Pisces feels secure in Cap’s presence and Capricorn feels deliciously lightheaded when exploring life with Pisces. These two bring just what the other needs to the partnership. Together, they take pleasure and benefit in breaking all the rules! As the final signs in the wheel of the zodiac, the Water Bearer and Fishes are both old souls. There’s a natural affinity between Aquarius ingenious brand of individuality and Pisces intuitive, spiritual wisdom. They enjoy an unspoken understanding, and comfortably journey together along the road less traveled. A blending of intellect and emotions enlivens them both. Pisces sensitive perceptions and Aquarians highly attuned intellect are perfect matches for each other. Both can feel like rebels that must live outside the box, but trouble can arise due to temperaments that are fundamentally different. Aquarius, being an air sign, operates from a primarily mental perspective, while Pisces lives in the world of feeling. However, they do both love to achieve the impossible and many discussions about how to solve worldwide problems will keep them engaged and inspired. Both signs are visionaries; this is a highly creative team that has much to offer the world. It’s the blending of the subtle energies that help these two to have a lasting relationship. Both intuitive people, they connect on an instinctual level, more than physically. They learn a lot from each other and enhance each other’s lives significantly. Aquarius Paul Newman’s and Pisces Joanne Woodward’s marriage proves that these two can, indeed, find lasting happiness together! There’s a natural fascination and respect, and if supportive contacts in the rest of their charts indicate, theirs can be an unusually satisfying relationship. Heavenly bliss – these two are totally in tune. They can get lost on a planet of their own, as they have an innate understanding of each other and don’t need anyone else to fulfill their days. These two speak the language of Deep Soul which few understand. Their resonance and instant understanding of the intense sensitivities of the other make a double Pisces relationship a rare example of a truly exalted love. The depth they see in each other’s eyes triggers their tendency to weave wildly romantic fantasies, which may find fulfillment in reality if they both have one foot on the ground. That is essential, because Pisces are dreamers who often have a tenuous relationship with the real world. If these two have the strength to make their dreams a reality, this relationship can blast off into the heights of inspired creativity. They share spiritual attunement and psychic perception. On some level, all Pisces are natural mystics and these two can find great fulfillment exploring worlds of higher knowledge and compassionate service. They reminisce about times of yesterday and discuss their plans for tomorrow with wide eyed optimism. Generally, they have similar values. Life is divine! Pisces brings such special gifts to any relationship, when they both come together there’s a potential for an extremely remarkable and inspiring union. This is a wonderful relationship, but it does need work. This couple must really guard against falling into the trap of getting lost in their own private fantasy, instead of being part of the real world. Keeping an individual life outside of the relationship is advisable.